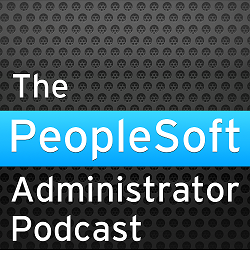 Those of us who work with PeopleSoft, and especially the HCM product, are all too familiar with the concept of effect-dated data, and the need to find data that was effective at a particular date. PeopleSoft products have always made extensive use of correlated sub-queries to determine the required rows from an effective-dated record. The JOB record is a the heart of HCM. It is both effective-dated and effective sequenced. I will use it for the demonstrations in this article. I am going to suggest an alternative, although Oracle-specific, SQL construction. Let's start by looking at the job data for an employee in the demo database. Employee KF0018 has 17 rows of data two concurrent jobs. The question I am going to ask is "What was the annual salary for this employee on 11 February 1995?". Therefore, I am interested in the rows marked below with the asterisks. This is the usual way to construct the query in PeopleSoft. It is also valid on all databases platforms supported by PeopleSoft, not just Oracle. This required three access of indexes on the PS_JOB table, and two accesses of the table, using 26 consistent reads. I have seen people use a combination of analytic functions and in-line views to avoid having to use the correlated sub-query construction. This has been possible since Oracle 9i. We get the same result, but now the index is scanned just once and we only need 14 consistent reads, so it produces a significant improvement. However, it still includes a sort operation in addition to the window function. We have to create a sequence number field in the in-line view and filter by that in the final query. This form of the analytic functions is documented for the first time in 12c, but is available in 10g (my thanks to Tony Hasler for introducing me to it). It works by effectively keeping a running maximum value of the columns in the order by clause within in group. Although this construction uses an additional consistent read, it has the advantage of not using either an inline view or a window function and does not sort the data. I think this construction could be useful in PeopleSoft. At first glance the SQL appears more complicated, but it in this example it removed two correlated sub-queries. Of course you can code it anywhere where you can simply enter SQL as text. However, it also has the advantage over the other analytic function construction that it can be coded in the PS/Query tool. 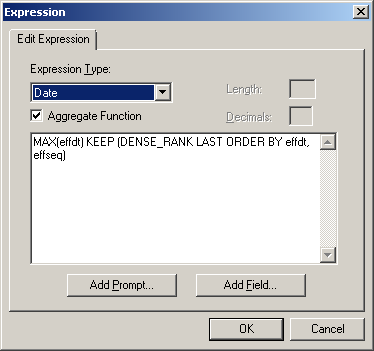 The analytic functions in the select caluse should be created in PS/Query expressions with the aggregate expression checkbox ticked. The analytic functions can be selected in the PS/Query, and their lengths and titles can be tidied up. This is the resulting SQL which is the same as before (with row level security added by PS/Query) and produces the same results.